I always get excited about summer, but for all the “wrong” reasons. Many people believe that summer is a time for rest and relaxation without a care about school, but my summers are always filled with excitement and planning for the new school year. I love the “blank slate” of a new school year! A few days ago, I was watching some of my favorite YouTube vloggers as they discussed their plans for the upcoming school year. One of them referenced a box of books she had been collecting for her kids to read, and that flipped a switch in my brain. 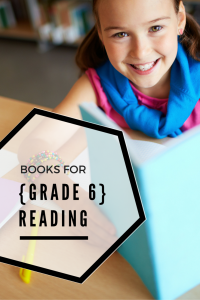 I pulled together some of my favorite literature resources and started putting together a reading list for our sixth grade year next year! I ended up with a list of twenty books, which I know is a little on the long side. I’m a voracious reader working with a voracious reader, so I’m pretty sure we will get through them all. However, I divided it into three sections: “Planned Book Studies,” “Additional Reading,” and “Read Aloud and Independent Reading,” because I know that we won’t be able to study them all in great depth. I added these books to the list because they were either (a) sequels or additional parts of a series or (b) enjoyable books I remember from upper elementary years. I will probably encourage independent reading of these books, though there are a few I would like to use as read alouds (marked with an asterisk). I’m really excited about this list, and I hope that these books are a hit! I think we will have fun exploring them. Hopefully, we will even get around to seeing a few of the movies based on these books! 😉 Regardless, our main focus this year will be on learning about literary devices and key literary terms, and I think this list of books will help us accomplish that goal. What’s on your reading list this year? I see a lot of our favorites on that list! Right now my 6th grader is reading Schooled. Later this year she will read The Graveyard Book, A Long Walk to Water, and Cinder.